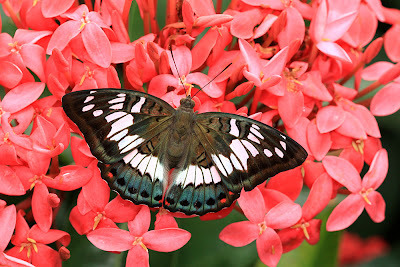 Late last year, I had the honour of being invited to write an article about the butterflies of the Singapore Botanic Gardens in the SBG Newsletter - Gardenwise. This was the second time that I had written for the Gardenwise, the first time being in Volume 17 published in July 2001. Another article published after ButterflyCircle's "Butterflies Thru' the Lens" exhibition at the SBG Visitor Centre appeared in Volume 27 in July 2006. So, after an eight year absence, the article Butterflies of the Singapore Botanic Gardens was published in Volume 32 Jan 2009 issue of Gardenwise. The Gardens is one of my favourite sanctuaries when I need to get away from stressful situations at work, and a walk amongst the lush greenery and abundance of nature is very often a therapeutic stress-reliever. The Gardens hosts one of the largest collections of plants – both native and exotic, in Singapore. The bird life (see Gardenwise 30 (2008) 14-19) is healthy, with over a third of the total number of species seen in Singapore occurring here. Amongst the plants and flowers of the Gardens, insect life is equally abundant. 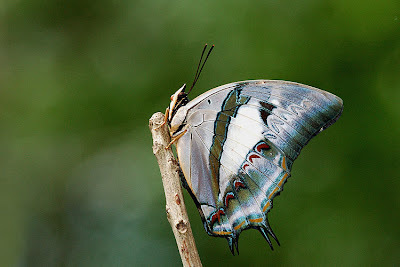 A casual observer will surely encounter a number of butterflies frolicking in the sunshine, busily feeding at flowers or just lurking around in the shaded understorey of the Rainforest at the Central Core of the Gardens. This is the first attempt at compiling a checklist of butterflies of the Butterflies of the Singapore Botanic Gardens Gardens. Whilst there have been many observations and personal checklists made by enthusiasts and visiting experts, it would be ideal to maintain a repository of sightings, preferably with photographs. Over the years, I have kept a personal checklist of the butterflies that I’ve observed whenever I visit the Gardens, and also sightings made by other enthusiasts and observers, some of whom have kindly sent photographs of butterflies that they have encountered. The list will, undoubtedly, keep growing as new species are found. 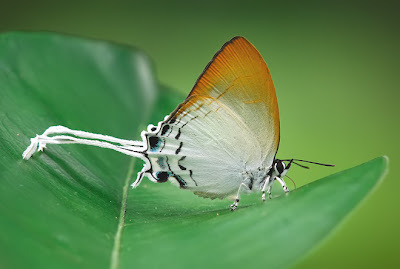 Butterflies can be rather choosy about their habitats, and being rather plant specific, many butterfly species are usually found more often in the vicinity of their caterpillar host plants. 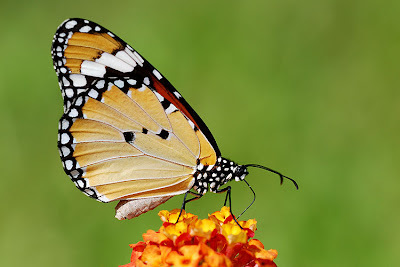 For example, the recent cultivation of Aristolochia acuminata and Passiflora foetida has brought in showy species like the Common Birdwing, Common Rose (and its subspecies, the Black Rose) as well as recent immigrants like the Leopard Lacewing and the Tawny Coster. 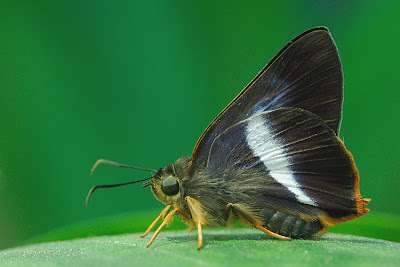 The collection of Zingiberaceae and Palmae in the Gardens has attracted the skippers – Hesperiidae, of which a few species are rare and not often seen elsewhere. The caterpillars of the Hesperiidae create leaf shelters out of their host plants, and hence can often be easily spotted (and dispatched) by a sharp-eyed gardener who would consider these pests! Two rare species which are noteworthy enough for special mention are the Orange Tail Awl (Bibasis sena uniformis) and the Blue Nawab (Polyura schreiber tisamenus). The former was a recent discovery for Singapore where it was found in the forested areas of the Central Catchment Reserves. Hence it came as a surprise to me when a small colony of caterpillars was found in the Gardens feeding on a common ‘wild’ shrub near the Tanglin Core. I have personally not seen an adult butterfly of this species in the Gardens, but upon breeding the caterpillars to adulthood, it was confirmed that the species is indeed the Orange Tail Awl. The Blue Nawab is another curious resident of the Gardens. A rare species in Singapore, the caterpillar of this species was originally recorded on rambutan (Nephelium lappaceum) but subsequently recorded by ButterflyCircle members on the red saga (Adenanthera pavonina), a Bauhinia species (along the trellises near Les Amis Au Jardins), and on the exotic but common Australian wattle (Acacia auriculiformis). It has been sighted regularly in the Gardens, and some years ago I was having a meeting on the 2nd storey of one of the bungalows when a Blue Nawab decided to stop and rest on a tree branch just outside the window! Another species to look out for is the Bamboo Tree Brown (Lethe europa malaya) which was spotted at the bamboo collection at the Bukit Timah Core. It is a rare species which is usually active only in the early hours and late hours of the day. A surprising find in the Gardens was the Courtesan (Euripus nyctelius euploeoides) of which a male was spotted some time back by Dr Ian Turner who emailed me a photo taken whilst on a routine walk around the Gardens. Even the parasitic plant Dendrophthoe pentandra which grows innocuously on its hosts’ branches way up in the treetops supports a number of beautiful butterfly species like the Painted Jezebel (Delias hyparete metarete), Green Baron (Euthalia adonia pinwilli) and a number of beautiful Hairstreaks like the Peacock Royal (Tajuria cippus maxentius). 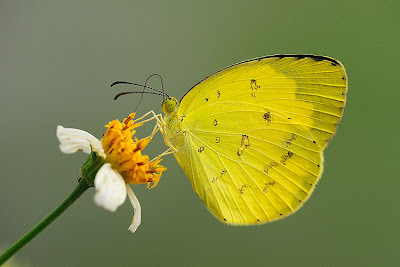 The other species in the checklist are predominantly urban butterflies that are relatively common in Singapore, but nonetheless contribute life and variety to the Gardens. As butterflies are mobile and some species can fly long distances in search of both nectaring and caterpillar host plants, it is beyond doubt that more species will be added to the checklist as time goes by, adding to the biodiversity and colour of the Gardens. Acknowledgments : Special thanks to Director/SBG - Dr Chin See Chung, and General Manager/SBG - Dr Wong Wei Har. Download a PDF copy of Gardenwise here.